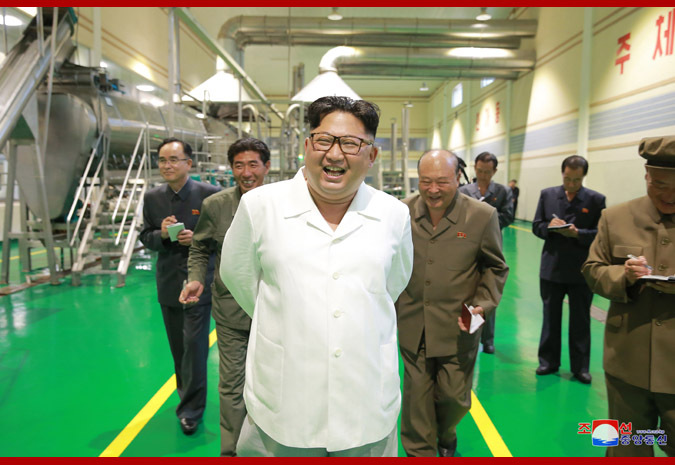 Pyongyang, July 10 (KCNA) -- Kim Jong Un, chairman of the Workers' Party of Korea, chairman of the State Affairs Commission of the Democratic People's Republic of Korea and supreme commander of the Korean People's Army, again gave a field guidance to the modern Samjiyon Potato Farina Production Factory which was built in Samjiyon County. He again visited the factory to discuss measures on the spot with a determination to build a new process producing 2 000 tons of processed potato food in a year with potato farina as raw material, as the process of producing potato farina with a capacity of thousands of tons was built last year. Going round the potato farina production process, he said that the factory has not been operated in full capacity after its appearance but it should produce a huge amount of farina with the potatoes harvested this year so as to supply a lot of potato farina and processed potato food to the people. He underscored the need to equip the factory with modern machines for making a variety of foods, including noodle, zeppole, cake and nutritious rice, with potato farina and produce tasty and nutritious processed potato foods on a full scale. He called for building modern potato farina factories at the potato production bases in the northern alpine region on the basis of the experience and design gained in having built a standard factory that can produce potato farina and various kinds of processed potato foods for the first time in our country. He acquainted himself with the store of produced potato farina and highlighted the need to thoroughly ensure the quality of potato farina by keeping good conditions for the store and to establish a scientific quality check system. He also called upon the factory to take good care of and manage production facilities and equipment on a regular basis, ensure hygienic environment enough to fit for a foodstuff production process and organize manpower management to ensure profitability so as to put the production on normal footing at a high level. He looked round a Korean-style circulating fluidized-bed boiler newly built at the factory. He noted with high appreciation that the new boiler based on our own design, technology and efforts to suit the actual conditions can supply enough steam needed for production process with less coal consumption. Now that the factory has all production process in a perfect way, it is urgent to increase the output of potato for putting its production on a normal basis, he said. After learning about the potato farming of the county, he stressed the need to conduct sowing in right season and in a qualitative way, manure and cultivate potato fields in a scientific and technical way and realize the comprehensive mechanization to radically increase per hectare yield. The Party will solve the problem of vehicles necessary for organization of potato transport fleet to carry harvested potato, he said, adding that it is important to gather it in time without wasting even a potato and fully supply potato to the factory. Saying that the Party harbors great expectations over the Samjiyon Potato Farina Production Factory which opened up a new path in the potato processing industry of our country, he earnestly called on its officials and employees to keep the factory in full-capacity operation in the spirit of devoted service to the people and thus make the factory built by the Party with much care truly contribute to the improvement of the people's diet. He was accompanied by Hwang Pyong So, Jo Yong Won, O Il Jong and Kim Yong Su, senior officials of the WPK Central Committee.